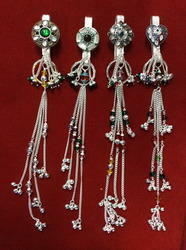 Chabi Challa or key chain is a popular waist jewellery in Indian households. The key chain is hung on the waist. The small tinker bells or ghungroos in the key chain produce a pleasant sound. We have a wide range of nautical brass key chains. Our nautical brass key chains are developed in numerous shapes and designs such as telescope key chain, ship wheel keychain, compass key chain and other marine key chain. this miniature diver's helmet is made of solid brass with copper accents. We have carved a niche amongst the most dominant names in this domain, instrumental in providing excellent quality range of Stylish Silver Key Chain. 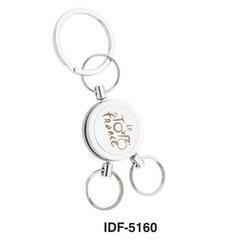 We offer Silver Key Chain to our clients. We supply unmatched range of these Metal Key Chain to our clients across the nation. These are designed and printed with the logo of Tanishq. This product is of a high quality and has a strong structure and long service life. These are demanded widely by our clients for their attractive designs, elegant looks and high service. We offer these at competitive prices in the market to our clients.